When I was a little younger, I never had any problems waking up to an alarm clock. It could go off once and I was up and out of bed- no matter what amount of sleep I had gotten the night before. I can very clearly remember quite a chunk of my life that involved midnight bowling which lasted 11pm-2am, followed by Waffle House, getting home at 4ish and having my alarm go off at 6 to be at work by 7 and working a ten hour day. No problem! Haha! The last few years (or the last decade!) have been quite different!!! Night shift is no joke. I have been known to sleep straight through my alarm(s). If I knew that I had to get up and be somewhere…. and not to mention look somewhat presentable… I would set about six alarms. Otis would always laugh at me when he would see me rolling through my alarm screen to choose which ones to set. His alarm goes off everyday- workday and weekend- at 6am. 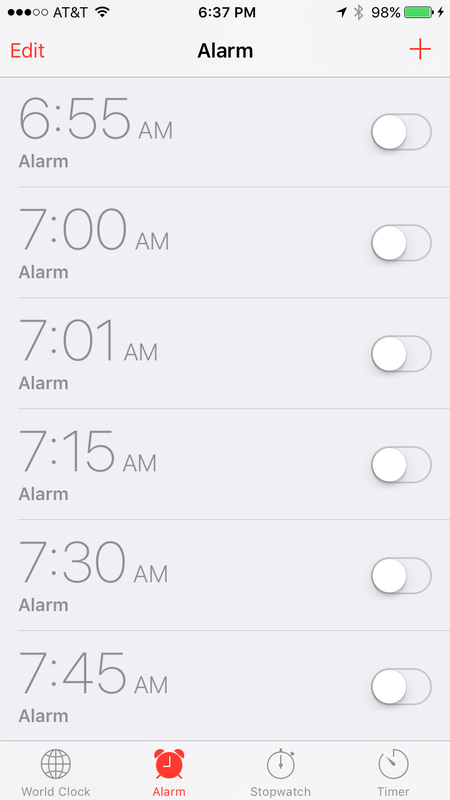 My alarm options are quite extensive. I had to have alarms for my nap times and just regular waking up and everything in between. I mentioned in my last post that last week I was still having a hard time adjusting to my new schedule. This week is a different story. We had our annual youth missions week (a separate post to come about that soon) and it has pretty much forced me back to the schedule of a “normal” person. After working during the day in the heat…. I was ready to go to bed at 10:30/11 and slept soundly all night long. That is cause for celebration in my book!!! I am now declaring myself happily adjusted!! To celebrate I am deleting my alarms- all 62 of them! !